There doesn’t need to be much explanation about these sweet little treats. Simply chop your banana and dip and sprinkle with a topping of your choice. 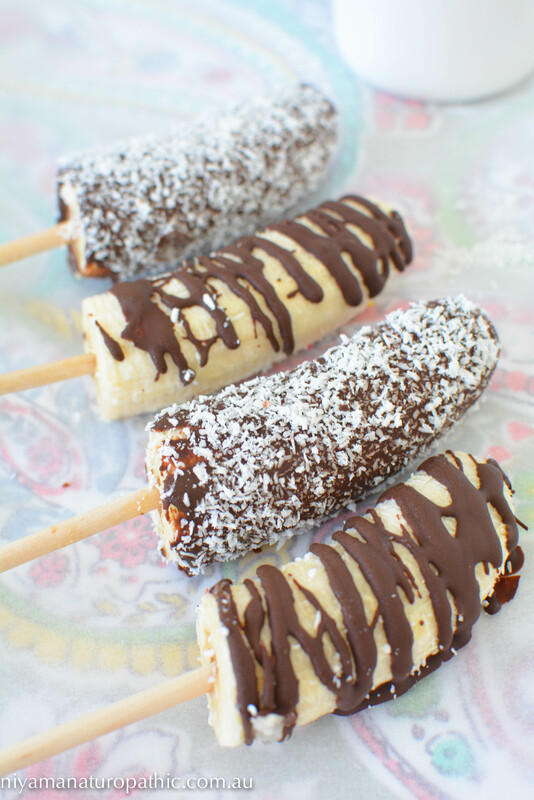 And there you have it, frozen banana pops. These are a great one for the kids, and for a colourful treat you can sprinkle them with 100’s and 1000’s – naturally coloured ones of course. Peel the banana and cut in half. Push the skewers into the banana. Place the chocolate in a small saucepan and gently melt it over a low heat. Once the chocolate is melted, roll the banana in the chocolate to coat them. Sprinkle the coconut or almond flakes over the melted chocolate. If you don't want to have too much chocolate, you can just drizzle the chocolate over the banana. Place the bananas on grease proof paper and pop them in the freezer for at least 2 hours.